COLUMBUS, Ohio – Eating pork and sauerkraut on New Year’s Day is a culinary tradition in Ohio and other parts of the U.S., with roots in Germany and Eastern Europe. The meal is believed to bring good luck and prosperity to those who eat it. 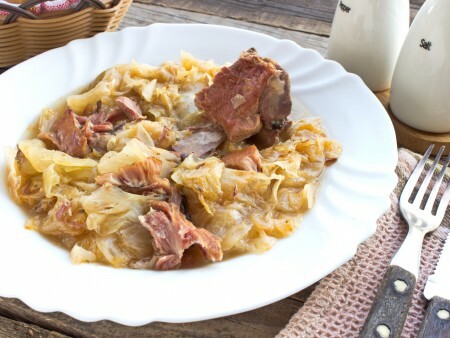 Pork and sauerkraut also represent prosperity in the Buckeye State’s agricultural and food-processing industries. And experts with the College of Food, Agricultural, and Environmental Sciences at The Ohio State University do their part by supporting swine and cabbage farmers with infectious disease research, education and variety trials. According to the 2012 U.S. Census of Agriculture, Ohio swine production has a farm value of almost $789 million, ranking eighth in the nation. Meanwhile, Ohioans farm some 1,723 acres of cabbage, 854 of which are harvested for processing into products such as sauerkraut and coleslaw. The state ranks 12th in cabbage production, with a farm value of $7.1 million. After experiencing a lower than normal output in 2014 due to the effects of porcine epidemic diarrhea virus (PEDv), the swine industry in Ohio and the rest of the U.S. has recovered nicely this year, according to Ohio State University Extension swine specialist Steve Moeller. OSU Extension is the outreach arm of the college. Moeller said there aren’t hard numbers yet on the state of the industry this year, but according to U.S. Department of Agriculture reports as of September 2015, the breeding herd is up 6 percent compared to 2014 and market hogs are up 17 percent compared to the same time last year. While the state’s cabbage industry hasn’t had to contend with a major pest or disease recently, research is still crucial to ensuring its viability and success. In 2015, as it has been the case during the past decade, experts with OSU Extension and the Ohio Agricultural Research and Development Center collaborated with northwest Ohio processors to test cabbage varieties for their suitability to the region’s soils and growing conditions. OARDC is the research arm of the college. The annual variety trials take place at OARDC’s North Central Agricultural Research Station, located in Fremont. Most Ohio processing-cabbage growers are located in Sandusky, Erie and Huron counties, which are part of the area served by this research farm. The cabbage trials and other research conducted at the Fremont station benefit local food processors such as The Fremont Company and Hirzel Canning Co., whose products include popular sauerkraut brands Frank’s Kraut, Snow Floss Kraut and Silver Fleece. Gahler and Fremont station personnel share the results of the cabbage trials and other experiments at field days offered throughout the growing season, during which farmers and processors can look at the different varieties and their characteristics side by side, in real time. The trials include a mix of repeat varieties from previous years and new ones that are not yet commercially available, Gahler said. If a new variety performs well, it could be growing on neighboring farms in the near future and become part of consumers’ tasty sauerkraut dishes — whether for good luck in New Year’s Day, or accompanying a bratwurst in the now distant summer months.